Venezuelan showjumper Andres Rodriguez has just moved into the world’s top 50 rankings, and after winning silver at the 2015 Pan American Games, will next year head to the Rio Olympics. 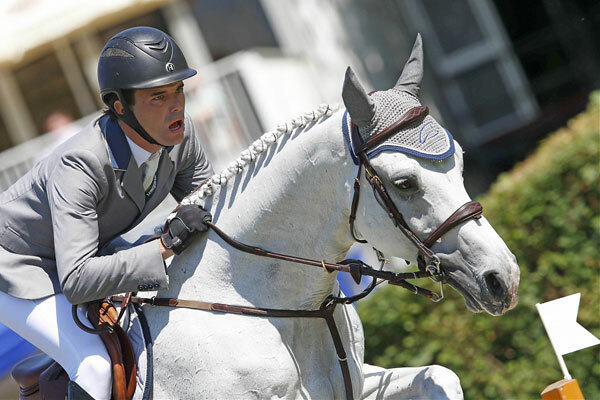 Rodriguez, 31, is based in Paris during the summer season and returns to his home in Florida every winter for the Winter Equestrian Festival in Wellington. He trains with legendary rider and coach Eddie Macken, and his top horses are Darlon Van Groenhove, Caballito and Fifty Fifty 111. Rodriguez, who is ranked 46th in the world, talks about his journey to the top of the sport, and his ambitions for the short and long term. Andres, you just entered the World’s Top 50. What does it mean to you? Being in the World’s top 50 really is a goal achieved. I made a plan to be in the top 100 by mid-2014 and top 50 by mid-2015 so I am very proud that the plan worked out perfectly. Right now I am focused on targeting the Top 30 which means direct invitations to CSI 5* events in the world such as the Global Champions Tour competitions. The biggest challenge when trying to improve in the rankings is to properly manage the horses. We have six horses competing at international level and we will always put their well-being before any specific goal. You are still a relatively new face in Europe, despite your very good results. You have been steadily and quietly climbing up the rankings. Are your results more important that any personal recognition? It is of course gratifying when colleagues, media and the public know you and respect your work but my true focus has always been my results. My own progress is what really matters to me. Recognition comes in time, when you have proved yourself. You come from Venezuela. How important are equestrian sports in your country? While Venezuela does not have a long showjumping tradition like countries such as Germany and France, I do believe my dream of an Olympic team is possible. We have a good group of riders competing at a top international level, and even though we missed the qualification this year, I am confident; we will come back stronger in four years! That being said, when I realized I could make a career out of my passion, I decided to move to Europe to start training with the Pessoa family. The development of the sport in Venezuela is still largely depending on riders learning abroad, where the sport is more developed. How difficult was it to make it to the top of the sport in your own country and later, at international level? When I was 16 in Venezuela, I received the Best Rider of the Year Award in the professional division and I was very proud, of course. It was a year later – when I moved to Europe – that I realized my career was far from started! It was a reality check when I began going to junior shows, but I was wholly committed and later competed in the Young Riders championships. It was a wake-up call to see how much more advanced other riders around the world were at my age, and this really inspired me to work harder. There is a big difference between participating at the highest level and competing there. To be competitive you need to do everything right and to have the appropriate horses. I believe that if I try to improve myself every day, things will come along. This is what always keeps me motivated, even when the conditions are not ideal. What was your first important decision to help yourself reach the highest level? I was always a team player. So I decided to put together a very good team including top professionals in all categories: trainer, veterinarian, blacksmith, grooms, chiropractor, assistant rider, sports psychologist, etc. What is your best equestrian souvenir/achievement to date? The individual Silver Medal at the Pan American Games this year probably is my best day at work! More than just the medal, it meant a spot for the Olympics in Rio 2016. Every athlete’s dream is to go to the Olympics and being able to go with a chance means everything to me. Tell us about your objectives for the next couple of years. My two main goals are the Olympics in 2016 and to be in the top 30 in the World Rankings. If you could win any title or any Grand Prix, what would it be? Apart from medals in the Olympics, the biggest Grand Prix in the world is Aachen. I will hopefully compete there for the first time next year, but to win in Aachen definitely is a huge aspiration. What personality trait(s) do you share with Darlon Van Groenhove? Darlon has a fighter’s personality – when we do not agree with each other, nobody wins! But when we fight together, competing is a lot of fun. What makes you wake up and work so hard every morning? Knowing that hard work and dedication pay off – and the hope that results will come out of mine.